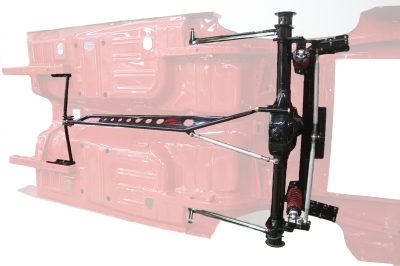 To take the vintage Mustang suspension to the max, Gateway Performance Suspension offers a three-link rear set-up that eliminates the factory leaf-springs and their inherent axle hop under hard acceleration. With its super-long torque arm, coil over shocks, and sturdy construction, the Gateway Performance Suspension three-link provides confidence for attacking corners on the road course or digging in off the line at the drag strip. The $3500.00 package comes with a 9-inch rear end housing; just add your 9-inch center section. 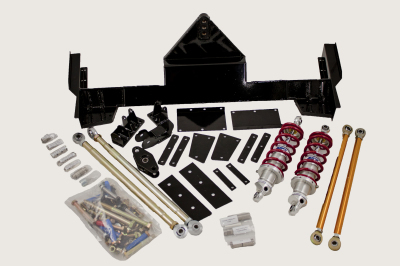 The base 3-link is designed to be a perfect match for the Super Stock GT Strut Kit. 3-Link packages are available with upgraded shocks to match the Street Avenger, Street Performer, Street Extreme, and Pro Front kits.